Boo the villain! Cheer the hero! Sigh as the heroine enters it’s melodrama! If you’ve ever wished you could share in the fun and laughter of melodrama but felt like you didn’t know enough to pull it off, then this video is perfect for you! ACT ONE: Melodrama Then and Now describes what made this unique theatrical art form popular ’back then’ in the 1800s and what makes melodrama even more popular now. ACT TWO: Basic Structure demonstrates the standard components to perform your show. This includes how to warm up your audience and how the master of ceremony can introduce the major characters. The informative section also addresses how the characters look and move, the music that accompanies their movement and the importance of lighting, sound, props and make-up. ACT THREE: The Melodrama in Action proves itself to be invaluable as an actual melodrama is performed before your eyes! You’ll be drawn into the thrills and excitement of watching professional actors perform Will The Showboat Show Tonight? in front of a live audience. This amazing performance is complete with music, costuming and a participating audience! ACT FOUR: The Olio illustrates the hilarious variety show that traditionally accompanies the melodrama. You’ll see why this side-splitting aspect of melodrama has become a show unto itself. ACT FIVE: The Summary ties it all together. Just like a melodrama, it all comes together in one complete package! You’ll never find another teaching tool like this for melodrama, so it’s time to get your group (but not the heroine!) on the “right track.” Melodrama: Beyond the Boos and Hisses is your tool for success. Perfect for any theatrical library, you’ll never be foiled again! 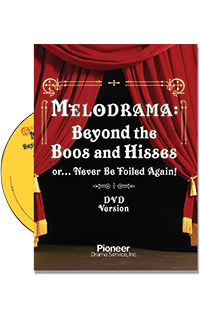 MELODRAMA BARGAIN PACKAGE — This package contains all of the best resources to help you stage an evening of melodrama: Melodrama: Beyond the Boos and Hisses and Between Hisses Text and CD all for only $85.00.